Where and When Did the Symbols "+" and "–" Originate? The symbols for the arithmetic operations of addition (plus; "+") and subtraction (minus; "–") are so common today we hardly ever think about the fact that they didn't always exist. In fact, someone first had to invent these symbols (or at least other ones that later evolved into the current form), and some time surely had to pass before the symbols were universally adopted. When I started looking into the history of these signs, I discovered to my surprise that they did not have their origin in antiquity. Much of what we know is based on an impressively comprehensive and still unsurpassed research (in 1928–1929) entitled History of Mathematical Notations by the Swiss-American historian of mathematics, Florian Cajori (1859–1930). The ancient Greeks expressed addition mostly by juxtaposition, but sporadically used the slash symbol "/" for addition and a semi-elliptical curve for subtraction. In the famous Egyptian Ahmes papyrus, a pair of legs walking forward marked addition, and walking away subtraction. The Hindus, like the Greeks, usually had no mark for addition, except that "yu" was used in the Bakhshali manuscript Arithmetic (which probably dates to the third or fourth century). Towards the end of the fifteenth century, the French mathematician Chuquet (in 1484) and the Italian Pacioli (in 1494) used "p" or "p" (indicating plus) for addition and " " or "m" (indicating minus) for subtraction. There is little doubt that our + sign has its roots in one of the forms of the word "et," meaning "and" in Latin. The first person who may have used the + sign as an abbreviation for et was the astronomer Nicole d'Oresme (author of The Book of the Sky and the World) at the middle of the fourteenth century. A manuscript from 1417 also has the + symbol (although the downward stroke is not quite vertical) as a descendent of one of the forms of et. The origin of the – sign is much less clear, and speculations range all the way from hieroglyphic or Alexandrian grammar ancestry, to a bar symbol used by merchants to separate the tare from the total weight of goods. The first use of the modern algebraic sign – appears in a German algebra manuscript from 1481 that was found in the Dresden Library. In a Latin manuscript from the same period (also in the Dresden Library), both symbols + and – appear. Johannes Widman is known to have examined and annotated both of those manuscripts. 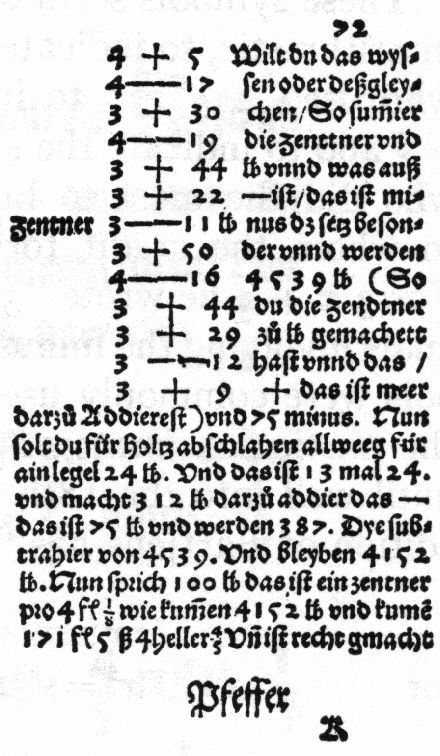 In 1489, in Leipzig, he published the first printed book (Mercantile Arithmetic) in which the two signs + and – occurred (Figure 1). The fact that Widman used the symbols as if they were generally known points to the possibility that they were derived from merchants' practices. An anonymous manuscript--probably written around the same time--also used the same symbols, and it provided input for two additional books published in 1518 and 1525. Figure 1. The first use of the + and – symbols in print in Johannes Widman's Behëde und Lubsche Rechenung auff allen Kauffmanschafft, Augsburg edition of 1526. In Italy, the symbols + and – were adopted by the astronomer Christopher Clavius (a German who lived in Rome), the mathematicians Gloriosi, and Cavalieri at the beginning of the seventeenth century. The first appearance of + and – in English was in the 1551 book on algebra The Whetstone of Witte by the Oxford mathematician Robert Recorde, who also introduced the equal sign as the rather longer than today's symbol "═." In describing the plus and minus signs Recorde wrote: "There be other 2 signes in often use of which the first is made thus + and betokeneth more: the other is thus made – and betokeneth lesse." As a historical curiosity, I should note that even once adopted, not everybody used precisely the same symbol for +. Widman himself introduced it as a Greek cross + (the sign we use today), with the horizontal stroke sometimes a bit longer than the vertical one. Mathematicians such as Recorde, Harriot and Descartes used this form. Others (e.g., Hume, Huygens, and Fermat) used the Latin cross "✝," sometimes placed horizontally, with the crossbar at one end or the other. Finally, a few (e.g., De Hortega, Halley) used the more ornamental form "✠." The practices of denoting subtraction were somewhat less fanciful, but perhaps more confusing (to us at least), since instead of the simple –, German, Swiss, and Dutch books sometimes used the symbol "÷," which we now use for division. A few seventeenth century books (e.g., by Descartes and by Mersenne) used two dots "∙∙" or three dots "∙∙∙" for subtraction. Overall, what is perhaps most impressive in this story is the fact that symbols which first appeared in print only about five hundred years ago have become part of what is perhaps the most universal "language." Whether you do science or finances, in Kentucky or in Siberia, you know precisely what these symbols signify.